Donald Grunge is talking that “Cowboy Talk” on new seven-track project. 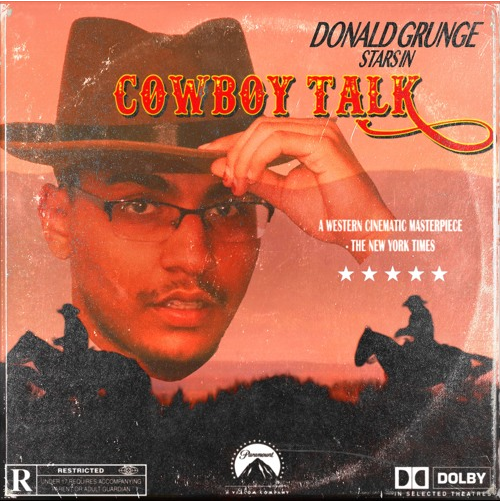 Boston has been popping up more and more, and today one of Boston’s most magnetic new emerging artists, Donald Grunge, hits the Elevator pages to premiere his western-themed tape, Cowboy Talk. We were most recently blessed with a Donald Grunge chorus on the highly catchy “Henny Sippa” premiered on our Youtube pages, but Cowboy Talk takes on a different approach entirely. Cowboy Talk finds Donald Grunge doing his best country music impression through his sharp stop-and-go flow. The energy on this seven-track project bounces between speeding bass-heavy tracks, like “Snake In My Boot”, but is able to kick it into a lower gear like with “Time After Time“. The tape is highlighted with Grunge’s single entitled “Guitar Grunge.mp3”, which when performed live has on more than one occasion has been called to run through an encore of the warbly hit. Check out the tape below, and let us know if you rock with Cowboy Talk.